Aiton, Hortus Kewensis ed. 1, 2 (1789) 417. Lamina pinnate, 25-70 mm long, pinnae ovate, acute, 5-12 x 3-6 mm, terminal pinna of +/- the same size as the rest, hirsute with appressed hairs interspersed with glandular hairs. Stipules 15-30 mm long. Branched, with 2-4 pseudo-umbels, with 2-4(-8) flowers. Peduncles 25-140 mm long, hirsute with appressed curly hairs interspersed with long soft patent hairts and glandular hairs. Pedicel 0.5 mm. 5, lanceolate, 6-11 x 1.2-3.5 mm, posterior erect, others patent to recurved. Hypanthium 11-35(-45) mm. Petals 5, white, cream-coloured, yellow, pale to bright pink, salmon-pink, or deep purple, posterior two with feather-like markings, spathulate, with rounded to emarginate apices, 11-24 x 3-10 mm, anterior three spathulate, apices rounded 10-23 x 2-5.5 mm. 5 fertile, posterior one 1.5-4 mm, lateral two 2.5-5.5 mm, anterior two 4.5-7 mm. Winter rains battering the Theewaterskloofdam bridge, not far away from the location of the plant on top of the page. I visited this spot on three separate occasions (always in August) and it always rained cats and dogs. Squeezed between the Boland Mountains, the Hottentots Holland Range and the Riversonderend Mountains, it receives one of the highest amounts of rainfall in South Africa, well in excess of 1000 mm annually. A fairly northern population of P. pinnatum on Pakhuis Pass shares the habitat with P. scabrum visible in the bottom right corner, and P. pallidoflavum and P. reflexipetalum are nearby. Curtis's Botanical Magazine, 1862, Tab. 579..
lessartiaefolium (Eckl. & Zeyh.) Steud. 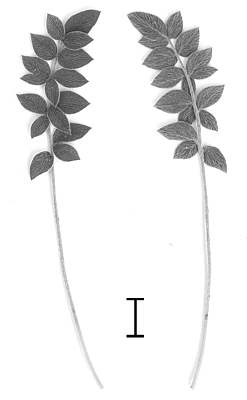 ornithopifolium (Eckl. & Zeyh.) Steud.